Meryl Streep wows critics with her performance as Margaret Thatcher in The Iron Lady. If anyone in the United Kingdom had doubts about an American actress playing a person who dominated British politics for over a decade, seeing The Iron Lady would be a revelation. Some British critics have slammed the film but they are ecstatic over Meryl Streep and are cheering her work as Margaret Thatcher, battling the demons of her old age and looking back at her life not just as a Conservative leader but also a wife. Reviews in America are decidedly mixed but there is hardly anyone who is not in love with Streep's work. She could be a formidable Oscar nominee. Streep whose hit films include Kramer vs Kramer, Sophie's Choice, Out of Africa and The Bridges of Madison County, was also chosen for a lifetime achievement Golden Bear at the Berlin International Film Festival 2011. The 62-year-old actress has been nominated for 16 Oscars. She won one in the supporting actress category in 1980 for Kramer vs Kramer, and three years later as the lead in Sophie's Choice. The Iron Lady united Streep with Phillida Lloyd, the 54-year-old British theatre director, who also directed the movie version of her smash hit musical Mamma Mia! The movie, which grossed $600 million worldwide, is Streep's biggest box office hit. But the Iron Lady is not an exuberant musical. And yet, box office observers say it could cross over $100 million worldwide. 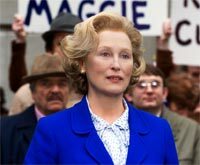 Even those who know little about Thatcher might want to watch the film just because of the nuanced and riveting performance by Streep. But the scope of its success will be known better when it will expand to some 600 theatres across North America on January 13, about two weeks before the Academy Award nominations are announced. The film shows the aging Thatcher as she attempts to sort the belongings of her late husband, Denis (Jim Broadbent). Newcomer Alexandra Roach plays Thatcher as the young Margaret Roberts -- a grocer's daughter with political aspirations. 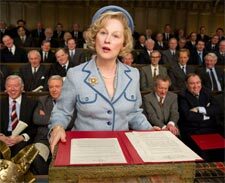 Streep picks up the role for the last 40 years, as Thatcher rises in England's Conservative Party, raises twins, becomes the first woman elected head of a government in the West and presides over a series of divisive policy decisions.